Last Friday M and I received remarkable gifts from two new friends, one his, one mine. At 8:30 a.m., after the girls had left for school, a rower from the club came by our flat bearing toys for the kids. She and I have been rowing together for a couple of months now, and she always looks out for me at the boathouse. She had come for dinner a few weeks earlier and had noticed the lack of toys for the kids. She grew up in Berlin not so long ago, being only in her mid-twenties, and so she arranged to pick up some of her childhood toys from her parents to share with our girls. She brought us a box full of Legos with a pirate set, tons of little people, and even some Lego monkeys, two parrots, and a shark. There was also a bag full of stuffed animals, and bag of books. She carried them into the living room and we sat down on the rug and spread them out in front of us. We couldn’t help ourselves from picking up some of the Lego pieces and putting a few together. There was even a rowing boat for a pirate to row up to the island, and two tiny oars. 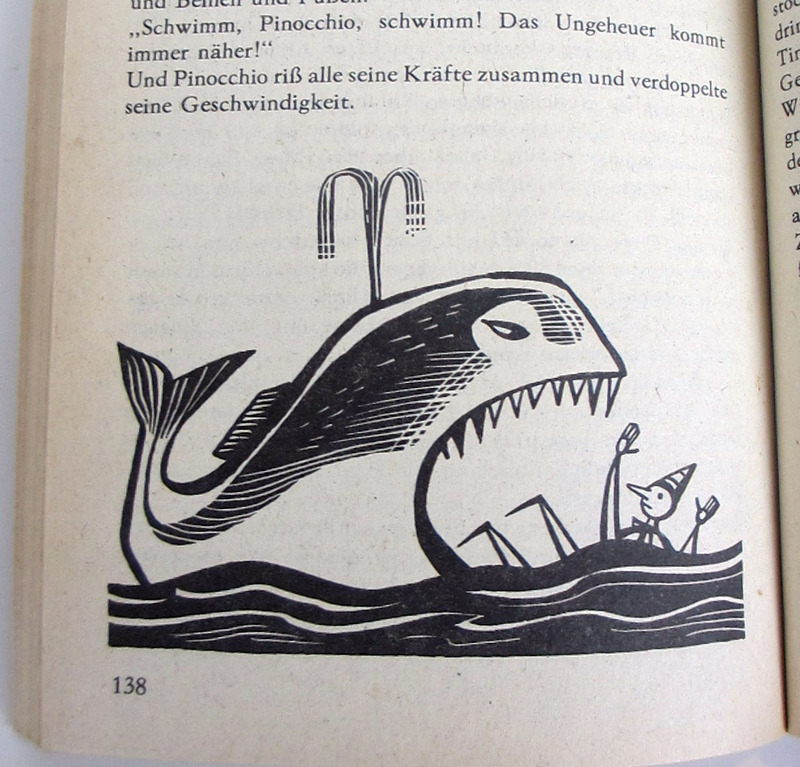 She pulled out her old books, faded with time, serious looking children’s books with the stories of Pinocchio and Brothers Grimm fairy tales, as well as less familiar stories like the tales of Die Rote Zora, and Munchhausen, and Wickie the Viking. All of these were in German, of course, and most were printed in East Germany, which makes sense, since that’s where her parents are from originally. I begin to think these books actually were her parents’ childhood books first, passed down to her, because many of them are dated from the 1960s, which would be about right since her parents are not much older than I am. The books feel fragile and have the scent of old libraries and you can’t help but handle them gingerly so as not to break their spines. It feels very special to have been entrusted with these books. We packed up the toys again and left them where the girls would be sure to find them after school, and we headed to an Italian café around the corner from E’s school. Every morning E and her companions walk past the café and drink in the scent of fresh-baked croissants wafting through the propped-open back door. I’ve been longing to try one for months now. We ordered the Kleines Frühstück, which was simply a cappuccino and a still-warm croissant and little pots of butter and currant jam, and it was an astoundingly delicious croissant, rivaling even those I brought back to the girls from the baker’s when we were in Paris. From there she asked me to show her around my neighborhood, which made me think of my statistics professor who said that teaching someone else forces you to learn the subject better yourself. And so it was, though we didn’t stray beyond the area I now know fairly well. A block or two into our walk my friend stopped, surprised by the sight of an orange apartment building I’d never noticed, and she was startled to realize that a friend of hers lives right there, just a handful of blocks from our place. She’d been to the friend’s place several times before, and twice now to our flat, but she had not connected that the two could be in the same little neighborhood. It amused me to watch the mental puzzle of piecing together Berlin on a local’s face; it gave me a glimpse of my own slow reveal of what I understand about my local geography. We went in a loop and I pointed out the main sights like the Winterfeldmarkt, but mostly the impression left from our walk was the overwhelming selection of local cafés the area has to offer. And then it was farewell and she was off to work. I went upstairs and found M ready to gather his things for our planned trek across the city. M had recently played a house recital of Schubert and Beethoven for a gathering at the home of Hanna, our professor friend. There we met a young man in the audience who also played piano and was in fact the immigration lawyer who had given M advice about finding a local affiliation for our visa application. He has a grand piano in his flat, and after hearing that M is practicing on an upright, insisted that M take a key to his apartment so he could practice there whenever he liked. After much Minnesota-style protestation M eventually took the key, and this would be the first opportunity to try the piano. I would accompany him, eager for a change of scenery. We took the subway to his neighborhood and made our way into Friedrichshain, a centrally located, former East Berlin neighborhood that sustained much damage during the war. Like other former East Berlin areas we’ve seen, you feel small in the face of the broad streets and frequent barren expanses that have not yet been revitalized. Not so long ago in a similar area, C had commented, “It feels lonely here,” and we had to agree with her. We reached his building on a street not so different from ours, and we opened the door to his first-floor flat that was lovely with modern furnishings, large artworks, and a grand piano positioned at an angle in the main room. But more than the sights of the apartment, I was struck by a sensation there was something naggingly familiar about the flat. The flat owner and his partner were away for a long weekend, so we had the place to ourselves. I set up my laptop at the dining room table, and M sat down to practice his pieces in the next room, and we worked companionably like that for several hours. My impression of the flat is most defined by the smell that hit us the moment we opened the door and never really went away. I don’t mean smell in a bad sense; there was just an undercurrent to the whole place, a sort of metallic taste at the back of your throat that I hadn’t noticed in Berlin before. It transported me immediately to other former Communist places we’ve visited, specifically apartments we stayed in for short visits in Sarajevo and St. Petersburg. I have no idea the source of the smell, and can only guess it is related to the heating system, or the water heater, or the electrical wiring. But wherever it comes from, it pervades your senses and you are reminded, with every breath you take, of the not-so distant past and the long shadow of Communism. Interesting to think that the scent of the Soviet occupation still lingers in the bowels of the city’s infrastructure. These intimate gifts of new friends—childhood treasures, free access to one’s own living quarters—deepened our sense of connection to Berlin and Berliners themselves. Their simple gifts undid the slights of grim shopkeepers and opened little windows to the past that hadn’t been there before. This entry was posted in City life, Getting lost, History and culture and tagged Berlin, Brothers Grimm, Friedrichshain, Lego, Pinocchio, Sarajevo, St. Petersburg, Winterfeldmarkt on November 20, 2013 by Jill M.. I totally remember that smell/feeling. I think part of it is brown coal…the really bad stuff they used to burn everywhere. Wow. Takes me back. Coal hadn’t occurred to me. I’ll have to ask around about this. Thanks for mentioning it.